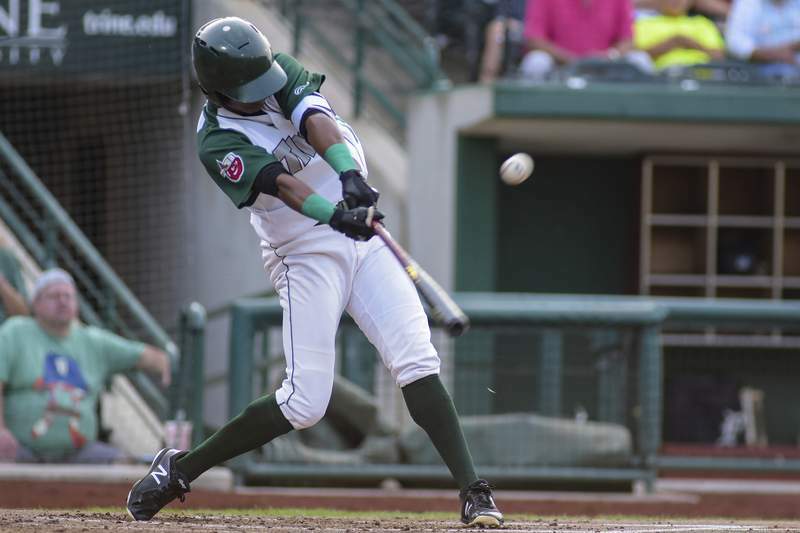 Mike Moore | The Journal Gazette TinCaps designated hitter Esteury Ruiz bats in the first inning against West Michigan at Parkview Field on Tuesday. The TinCaps open their second-to-last home series of the season Wednesday night. The game is significant not only for its playoff implications – Fort Wayne remains in a tight Eastern Division race with several other teams – but also because the attendance at the game will likely put the team over 4 million fans at Parkview Field since the stadium opened in 2009. The TinCaps plan to celebrate the milestone by giving away $10,000 worth of merchandise, split among 31 fans. On the field, the TinCaps are looking for their fourth straight victory. They need to keep winning, because Great Lakes shows no signs of slowing down. The Loons, just a half-game behind Fort Wayne in the standings, have won seven games in a row and nine of 10, keeping the pressure on the TinCaps and West Michigan Whitecaps, who currently hold the two Eastern Division playoff spots. In pursuit of that fourth straight win, which would be the team's longest win streak since July 2-5 when it swept Great Lakes, Fort Wayne will send Midwest League ERA leader Osvaldo Hernandez to the mound. The 20-year-old left-hander has gotten better and better as the season has gone on and enters tonight's matchup with a glittering 1.81 ERA. He has a chance to become the first pitcher in the league to reach 11 wins with a victory tonight, as well (yes, wins are an arbitrary stat, dependent on factors outside the pitcher's control. Counterpoint: leading the league in a positive category is positive and should be discussed). Hernandez is coming off one of his best starts of the season, a six-inning run of dominance that saw him give up just one hit and no runs while striking out five. "He extracts all he can from a fringey slider thanks to feel for east/west location, and he has a 12-6 curveball with which he pitches backwards. When he misses, he misses down. He has a limited ceiling but could pitch at the back of a rotation." Longenhagen added that Assad throws a fastball that touches 94 mph, so the TinCaps will have to be ready for some velocity tonight. Fort Wayne's offense is coming off a somewhat workmanlike performance in Tuesday's victory. The TinCaps didn't put together a big inning, but scored single runs in five different innings to win 5-1. They scored in the sixth, seventh and eighth, turning what had been a close game into one of the first comfortable wins they've had in a while. The offense has been itching to break out for several games and with Hernandez on the mound, it might not need much to secure a fourth straight win.